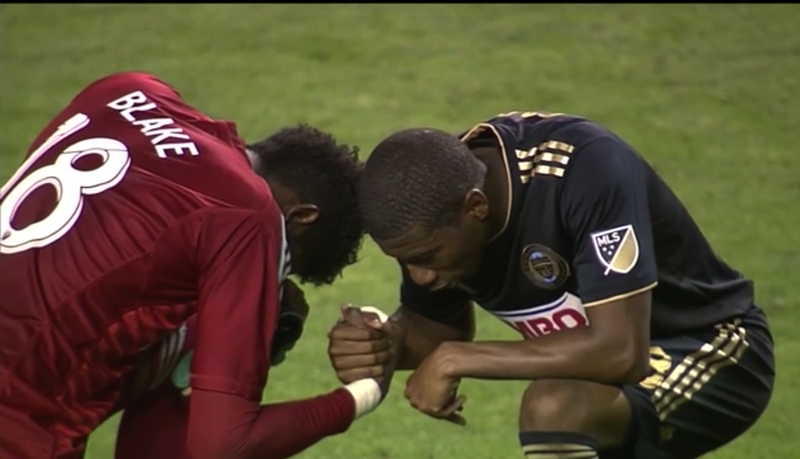 Editor’s note: This is part of a PSP series titled, “Raves,” in which PSP writers take a break from critical analysis and straight reporting to rave about a particular person from the Philadelphia soccer scene. For more about the series, read the introduction here. To read all posts in the Raves series, click here. Morning, November 2010, Pennypack Park. My last day of play in Philadelphia’s Casa Soccer League. I’d taken a job in Washington, D.C., due to move the following January. My team has just played its final game. I don’t remember much of it beyond walking off the field. I’m a starting center back. It’s not my best position — goalkeeper is — but it keeps me in shape. Then I run into John Horn. His team is short of players. They could use a goalkeeper for their upcoming match. Am I available? Of course. I’m ready to go. And boy, was I ready to go. I played a good game, but the only play I remember is the penalty kick. We give up the penalty. I prepare. I’m not much for distracting penalty takers. They psyche themselves out enough. I’m all about reading body language and reacting instinctively. I guess wrong and dive the wrong way. But as I go down, I extend my leg back to its full extent in the opposite direction. Live ball in front of the net. The penalty-taker goes for the ball. Everyone rushes in. I don’t remember exactly what happened next. Did I save it? Did a defender block it? Did it go over the crossbar? Seriously, I do not remember. But I remember they didn’t score. The ball went out of bounds. Somehow, we stopped it dead. My teammates are pumped. Someone tells me it’s the best save he’s ever seen. It’s not the first time someone has told me that, but it is the last. We walk off with a result. Draw or win, I don’t remember. But the euphoria, I remember that. And the chaos, I remember that too. I go looking for another game. I don’t want to leave. I want more. A fourth division team needs a goalkeeper. It’s the lowest division, but it’s soccer. I’m in. In the first half, I leap up in traffic to punch a high ball in the box. An opposing attacker takes my legs out, and I hit the ground hard. I’m down. Can’t breathe. Sharp pain, familiar. I know it well, because I’ve done it a few times before: Cracked ribs. The game soon continues. I get up and play on. American players are tough. We play hurt. Late in the second half, some 6-3, 200-pound guy without sufficient ball or body control barrels downfield on the counter past the last defender. I wait for the bad touch that sends the ball too far, then fly off my line, slide in for the ball, make the save, and take a knee to the kidney. Pain like I have never felt in my life. Oh God. I’m going to die. Over the years, I have broken bones in both hands, both arms, various ribs. I’ve sprained both ankles and wrists, permanently damaged my pitching elbow and left bone chips floating around to this day, suffered at least a half dozen concussions (two knocked me out, I lost 20 pounds in a week after another), and suffered a few more injuries that didn’t make this highlights list. Never have I felt such pain as that day at Philly’s Pennypack Park. I eventually got up. Did the tough guy act for a few minutes. I don’t remember if I finished the game. I drove home to an empty house in Mount Airy, wondering if I’d piss blood, called my wife in Los Angeles (she was at film school), called Dr. Phelan after she told me to, got a call back even though it was Saturday, and then, barely able to walk upright, went to the hospital alone. That’s how my Casa playing career ended. Goalkeeper is a rough position. The highest highs. The lowest lows. Long lulls. Absolute chaos. One minute, you’re on top of the world after some acrobatic feat stops everyone dead in their tracks with amazement. Then they kick you in the kidney and crack your ribs, and you feel like you’re going to die. All of which brings me (finally) to Andre Blake, the best shot-stopper I have ever seen. I have seen this guy take hits like you wouldn’t believe. Sliding cleats to the leg, knees to the chest, midair collisions that dropped him like a bag of dead bones, even a headshot to a goalpost. He gets up every time. Then he makes saves you can’t believe. Do you remember that 2015 game up in New England? Save after save after save after save. Each one better than the last, culminating in that last one that left fans and announcers in such shock that, if you haven’t watched the video above, well, just stop what you’re doing and go do it. Seriously, we’ll wait. Go watch. It’s a master class, a highlight reel unlike any you’ve ever seen. Eleven shots on goal. The only one that netted was the penalty. Blake stopped the rest, most in spectacular fashion. It was Blake’s breakout game. It set the tone for what would follow. Blake ended Union goalkeeper jokes. And if you don’t remember the bad old days of Rais Mbolhi and the endless number of truly hilarious jokes his tenure prompted, then read the Comments section of this story about his departure and refresh your memory, because they are still funny and never get old, and they provide context about just how big an achievement this actually is. Andre Blake is just that good. Goalkeeper is the most unique position on the field. The rules are different. The playing experience is different. You can go the whole game and not break a sweat, or you can spend 90 minutes bouncing off the ground and dusting yourself off as you dive left, dive right, slide in, jump high, and throw your body around in ways the human body isn’t meant to do. Blake does it every game, and he does it quietly and humbly. He’s not a screamer. He’s not a showboat. After every game, you see him clasp hands with teammate Ray Gaddis, take a knee, and give thanks to God in prayer. No Union player is as valuable as Blake. No MLS goalkeeper is as valuable. Even if your team is garbage, which the Union were (but no longer are), when you got a guy in the back who can stop bullets like Blake can, you have a chance. And if your team is good, a goalkeeper like Blake can be the difference-maker who wins you a championship. Enjoy Blake while you have him, Union fans. He’s a treasure, the likes of which we may never see again. Amen to all of this. And it’s crazy that the only European league interested in him was the one that couldn’t sign him (thanks to their weirdo rules). I can’t believe some team from Ligue 1, at the very least, won’t want him. P.S. 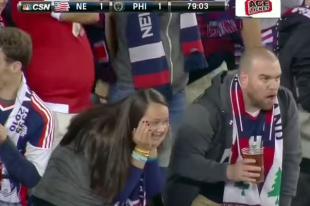 The best part of that New England save-fest was the Revs fan sitting goggle-eyed with his beer in his hand whose picture graces the top of this post. I still remember seeing that guy on the broadcast and cracking up laughing. Oh yeah. I went looking for him because I remembered. That guy is awesome. That’s a helluva story, Dan. Well told. Bravo, bravo Blake had me at his highlight wheel at the Superdraft! Many years ago, when the Flyers were winning their championships, the saying in honor of their goalie was, “Only the Lord saves more than Bernie Parent.” I hesitate to resurrect it because of Andre’s obvious religious mindset, and do not mean to say it blasphemously, but some of the saves that he has made are more than reflex. I don’t understand how his arms can telescope like they do. He is great on the save. Now, if he can learn distribution and when to charge from the goalmouth, he will be unstoppable. What a tremendous find he has been.